Good news for self-published Amazon authors, some interesting findings on the (lack of) effectiveness of DRM and more proof of continuing tectonic shifts in the publishing industry. According to a new report by AuthorEarnings.com, self-published authors on Amazon are now earning more in combined royalties from their books than authors from all "big five" publishers -- Hachette, HarperCollins, Macmillan, Penguin Random House, Simon & Schuster -- combined. 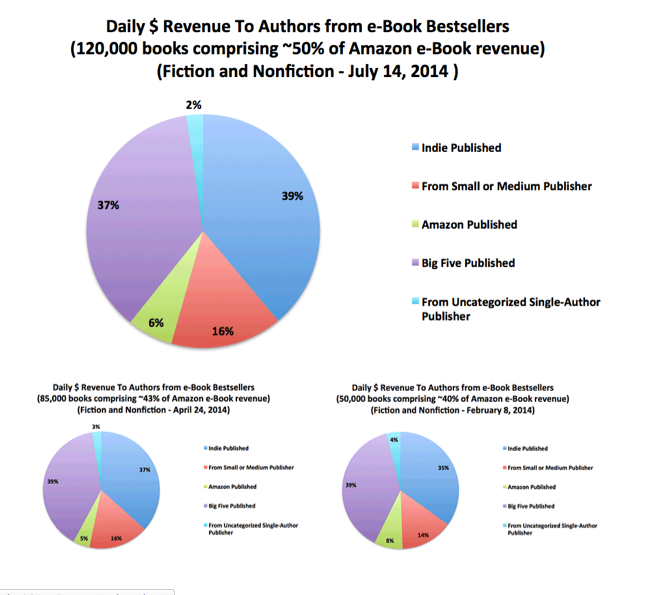 Moreover, self-published authors are now earning nearly 40% of all ebook royalties on the Kindle store. It wasn’t surprising to see that most Big 5 books employ DRM, but we were shocked to see that it is practically 100% of them. Indies, on the other hand, locked down roughly 50% of their titles. Since there isn’t any variation in the Big 5 books, we are forced to look at the self-published titles for any effect on sales, and indeed there is one. The 50% of non-DRM ebooks account for 64% of total unit sales. Indie titles without DRM sell twice as many copies each, on average, as those with DRM. The full report is here.